In today’s fast-paced market, we use digital technologies for everything from collaborating with our team to serving customers. But despite the wealth of technology at our fingertips, many businesses still rely on manual processes for their day-to-day tasks. A recent study revealed that companies that digitize their workflows save 3.1 hours each week per employee on document-related tasks, which helps to boost their productivity by over 40 percent. 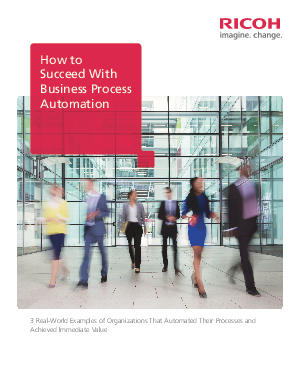 Get this white paper to understand how automation can improve your systems for improved efficiencies that can lead to increased innovation, revenue and market share.